Northwest Indian College’s Early Childhood Education Program was selected as a recipient of the Wakanyeja “Sacred Little Ones” grant funded through the W.K. Kellogg Foundation and distributed by the American Indian College Fund. 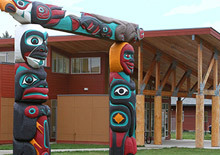 $800,000 has been awarded over a period of four years in order to make improvements to the ECE degree program at NWIC and at the NWIC Early Learning Center, Lummi Head Start, Lummi Nation School K-3rd grade and Ferndale Eagleridge Elementary, K-3rd grade. We are honored to receive and be a part of this project. 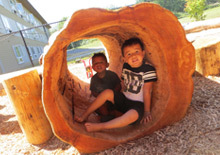 The Wakanyeja “Sacred Little Ones” early childhood education initiative is for and by the Lummi Community’s children and families. Four cohorts will be formed—children at the participating schools, their parents, and their teachers as well as Lummi campus students in the ECE degree program. As part of the planning for the start of services in January, we invite all interested community members to be part of the discussions of what we do, how we do it, and what we want to learn to improve early education, and, indeed, all education for our children. Goal 1: Improve cognitive skill acquisition, specifically, language and literacy (both Lummi language and English). Goal 2: Improve social emotional health for young children, specifically by using the “ Parenting and Teaching by Connection” approach. Goal 3: Improve early childhood teacher quality in the Lummi community through early childhood education teacher training at Northwest Indian College and through a peer support system for teachers. Goal 4: Bridge early childhood and K-3 education for participants between NWIC Early Learning Center, Lummi Head Start and Lummi Nation School or Eagleridge Elementary. 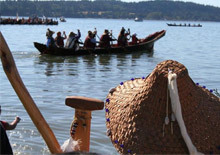 Goal 5: Integrate Lummi language and culture into curriculum development and instruction in the NWIC ECE teacher preparation program, NWIC Early Learning Center, Lummi Head Start classrooms, and Kindergarten through grade three at Lummi Nation School, and Eagleridge Elementary. Goal 6: Empower families and the Lummi Community to act as agents of change in education for our children. Interested in some of these goals? If so, you can join us for one or more of the “Community Working Group” meetings this fall. Please consider being a part of deciding how this project will proceed--we want to hear from you. Being a part of what happens for young children is a surefire way to touch the next seven generations of this community for positive outcomes for children, families, and our future. If there is a topic that is near and dear to your heart, and the meeting date and tie doesn’t work for you, we still want your input. Let one of us know, and we will set up a time to get together, email, or talk by phone to listen to your concerns, questions, and contributions.